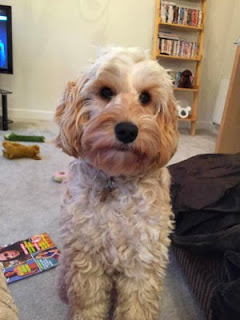 Back in the summer last year I attended a fab event 'Paws in the Park' and got to meet so many gorgeous pooches, one of these was a rather adorable ball of fluff called Lady, a Cockapoo, at the time she was only a few months old and unbelievably cute! Laura, Lady's mum, came over for a chat after seeing a painting I had on display of the lovely Boris, a Labradoodle. Laura then got in touch a few months ago ready to go ahead with a portrait of her lovely Lady as a surprise birthday present for her husband. As she was still growing and changing so much it took a while to find the right photo but I think you'll agree she does look gorgeous in the one we finally decided to use. 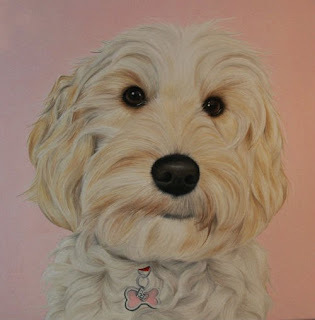 Lady really does live up to her name and even has a gorgeous pink bow shaped tag with a diamante 'L' we decided to go for a pink coloured background to suit Lady's character and I have to say I was really happy with the end result, the pink colour in the background really compliments Lady's colours and helps her to stand out on the canvas, I generally do like to keep the background very simple so that all the attention is on the pet but think by adding just a touch of colour can really make a difference.